Part IV's Rohan, Okuyasu, and Kosaku added. 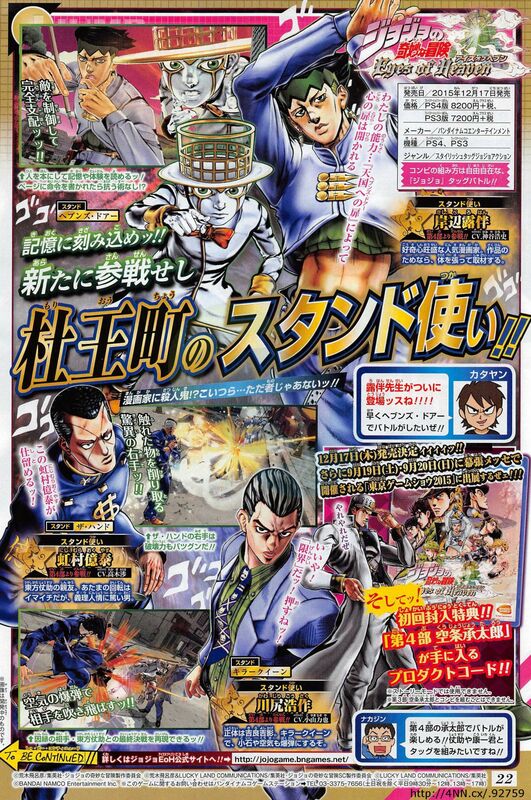 JoJo’s Bizarre Adventure: Eyes of Heaven will launch for PlayStation 4 and PlayStation 3 in Japan on December 17, the latest issue of Weekly Jump confirms. The game will cost 8,200 yen (plus tax) on PlayStation 4 and 7,200 yen (plus tax) on PlayStation 3. First-print copies of the game will receive a download code to play as Jotaro Kujo from Part IV: Diamond is Unbreakable.